WSXC10 camera is designed to hold crystals in the process of determining crystallographic orientation using Laue back reflection. The diffracted beams are registered by the wet film photographic method. Special adapter that fixes the goniometer on the wire saw horizontal carriage. A crystal can be rotated 360° in one axis with 0.1° vernier and 120° in second axis with 0.1° vernier. 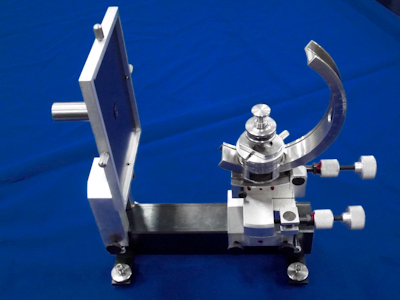 The goniometer can be fixed to the WS-22 , WS-22B Wire Saw. 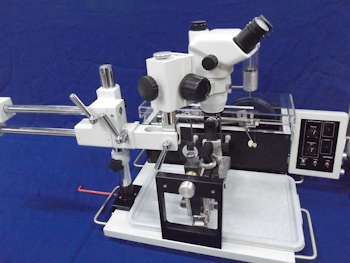 The crystal is cemented to a mounting table which is the central element of the goniometer. There are precision rises available to increase the height of the goniometer when working with crystals that are too small to reach the beam. If the face of the crystal is rotated to a position that is not in the path of the x-ray or optical beam, the table can be moved up to 10 mm on either side of center in order to realign the crystal with the x-ray or optical beam. After the crystal is properly oriented, the whole goniometer is transferred to a saw for cutting the oriented surfaces or slices. WSXC-10 camera is constructed of hard stainless material. The scales are deeply engraved and filled with a black ink. The WSXC 22 camera is used for the orientation of single crystals samples using transmition or back reflection X-ray Laue method. WSXC-22 camera is designed to hold crystals in the process of determining crystalografic orientation using Laue back reflection or transmission techniques. 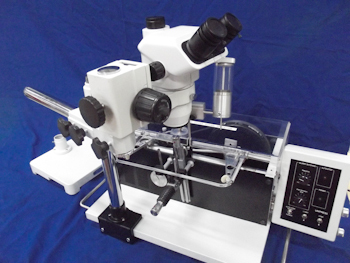 The crystal is cemented to a mounting table which is the central element of the goniometer. There are precision rises available to increase the height of the table when working with crystals that are too small to reach the beam. If the face of the crystal is rotated to a position that is not in the path of the X-ray the table can be moved up to 10 mm on either side of center in order to realign the crystal with the X-ray beam. Crystal can be rotated 360° around axis which makes circulation around horizontal axis with range of 140° and vernier of 0.5’ and vertical axle in range of ±10° and vernier of 0.5’. After orientation goniometer is fixed on Unipress precision wire saw horizontal carriage to cut sample along earlier determined crystalographic plane. WSXC-22 camera is constructed of hard stainless material. The scales are deeply engraved and filled with a black ink.